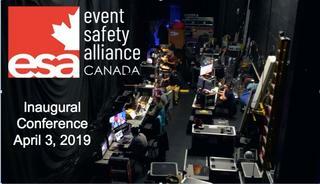 What is Event Safety Alliance Canada all about? • They will provide high quality health and safety learning opportunities to Canadian arts, entertainment and live event communities. • They strive to share expertise, solutions and reasonable practices based on Canadian needs and legislation. • Their goal is to prevent injuries and incidents, and protect both people and events. • By maintaining a strong relationship with the ESA, we will participate in the development of global resources to address industry challenges. In preparation for the busy 2019 summer event season, we invite you to attend the inaugural Event Safety Alliance Canada Conference on Wednesday, April 3, 2019 in Toronto, ON. This conference is designed to provide practical insights for production suppliers, event production companies, festivals and roadhouses, municipalities, colleges and universities, labour organizations, and all those who provide support to the live event industry. You’ll have a full slate of relevant topics presented by experts in the field, as well as an opportunity to share event safety experiences with colleagues. You’ll learn directly from like-minded professionals from around the world – their experiences, expertise and perspectives. Join them for a day of inspiring speakers and the opportunity to connect with fellow event professionals – from venue staff to suppliers – and all those who make the shows happen in this great country of ours. Grab your seat at the Conference HERE. Add Event Safety Alliance Canada - Inaugural Conference 2019 to my calendar.